October has been a busy month with lots happening at Lockyer Farm Machinery. Firstly, with October being Breast Cancer Awareness Month, we have got on board with Husqvarna and the McGrath Foundation and have been busy raising funds with the boys and girls getting dressed up in pink. The promotion currently being run by Husqvarna is purchase a PINK TOY CHAINSAW and $10 will be donated to the "Saws for a Cause" campaign. These toys saws not only look super cute, make actual chainsaw noises and has a rotating plastic chain but would also make the perfect Christmas gift. Every purchase of a PINK TOY CHAINSAW also goes into the draw to win one of three Limited Edition PINK 450 Petrol Chainsaws valued at $1049. Here at Lockyer Farm Machinery, we have gone one step further and are having "Biscuits for Breast Cancer". Bring you loose change in with you when you visit us, pop a donation in the donation box and sample some of our super delicious HOME MADE BISCUITS. So help us JOIN THE FIGHT and GO PINK. We all know someone that is affected by cancer, so dig deep and help us help those who are doing it tough. LANDINI HIGH CLEARANCE TRACTORS have landed. We are pleased to announce that Lockyer Farm Machinery is now a Dealer for High Clearance Landini Tractors. We currently have two models in store, the PowerFarm 90 Rops Tractor and the 5D High Clearance Cab Tractor. Already generating a lot of interest, we suggest dropping on in and talking to our sales team who are more than happy to show you around the new tractors and will give you the best deal possible. We are also able to offer Parts and Servicing to all Landini Tractors. 4 Wheel Drive Filter Kits are now available through our Parts Department. Donaldson Air Filters, Oil Filters and Fuel Filters for Toyota, Holden, Nissan, Mitstubishi and Ford are now stocked at Lockyer Farm Machinery. Protect your investment with heavy duty 4wd filters from the Diesel Filtration Experts. With Christmas just around the corner, Mitch has been busy stocking up on Gifts for all ages. 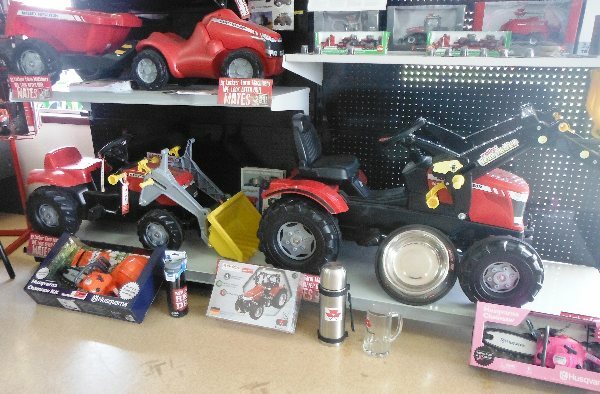 We have Massey Ferguson and Husqvarna branded Toys such as Ride on Tractors with trailers, Toy Chainsaws, Puzzles, Meccano, Scale Models, Dog Bowls, Cups, Glasses, Thermos, Beer Glasses, Drink Bottles, Keyrings, Apparel and more. If we have not got it, just ask and we will try our best to source what you are looking for. 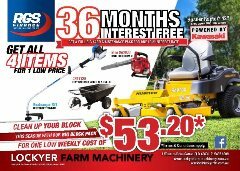 There is no better time to purchase a new Mower and Garden Care Package than now. We are able to offer for a limited time 0% Interest over 36 months on purchases of new Garden Care Equipment. 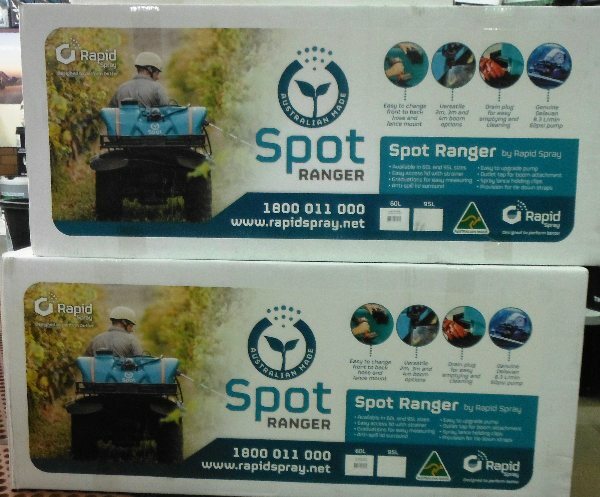 Create your own Garden Care Package suitable to your own requirments, we will work out your monthly repayments and even assist with the application process. Choose from our large range of Hustler, Husqvarna, Bushranger and Craftsman products. Our Sales Team are ready to find the right machine for you. With spring weeds taking over the majority of yards, there is no better time to grab yourself an awesome deal on Spray Tanks. With a variety of sizes and models ranging from hand sprayers of only 5 litres up to 95 litre spot sprayers to tow behind your mower, our Parts Departement can find the right sprayer for your application. We also offer large spraying units for our Farming Community through our sales team.